Thanks to a student-driven initiative, environmentally harmful plastic bottles of water are disappearing from the Wesleyan campus. She notes that 90 percent of the environmental impact from a plastic bottle happens before the consumer opens the product, most of which will end up in a landfill. Moreover, bottled water’s regulation by the U.S. Food and Drug Administration is less stringent than the U.S. Environmental Protection Agency’s regulation of tap water. In the first year of the effort, the students successfully eliminated bottled water from Weshop through a collaborative effort with Michael Strumpf, Bon Appétit’s Resident District Manager. By the following spring, bottled water had been removed from Bon Appétit’s Pi Café, as well. According to Oliphant, the Wesleyan Student Assembly (WSA) Dining Committee and Bon Appétit reported no tangible effect on consumer satisfaction or revenue generation as a result. 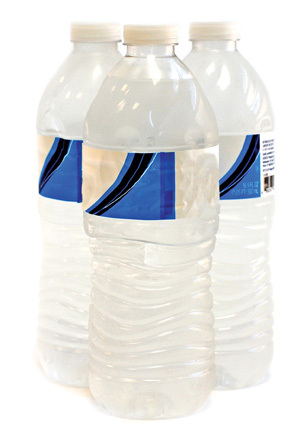 In fall 2011, the College of the Environment announced that it would sponsor two interns to work toward removing bottled water from every part of campus. To this end, Oliphant and Hailey Still ’12 were hired in December 2011. In spring 2012, the WSA unanimously passed a resolution to eliminate bottled water from campus. A similar measure also passed in the Sustainability Advisory Group for Environmental Stewardship. Bottled water was removed from all vending machines on campus, and at Reunion & Commencement Weekend in May 2012, the bottled water order was substantially reduced and filtered tap water stations were provided instead. And last summer, five-gallon jugs of water were removed from water coolers in most department offices—replaced by filtered tap water stations from W.B. Mason. Bottled water was also eliminated from Usdan Café. 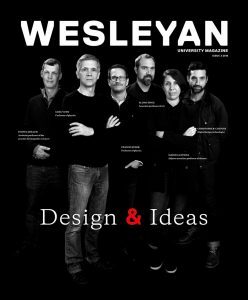 Wesleyan’s new sustainability coordinator, Jen Kleindienst, has worked with students and staff to continue these efforts. The Sustainability Office, the Center for the Arts’ Feet to the Fire Initiative, the Patricelli Center for Social Entrepreneurship, and the College of the Environment co-sponsored a student competition to design a mobile water station, which will be used outdoor events. The station, designed by Tavo True-Alcalá ’15, Brent Packer ’15, Madeleine O’Brien ’16, and Nina Gerona ’15 and built by the Wesleyan Machine Shop, will debut at this year’s Reunion & Commencement Weekend. ©2018. Wesleyan University All rights reserved.